In the summer of 2015, Puerto Rico experienced severe drought conditions not seen in more than 20 years. Hundreds of thousands of residents endured severe water rationing and nearly 45% of the island was classified as "moderate to severe drought" with another 20% experiencing "extreme drought". Although many associated the drought with El Nino, a new paper looks at the role of Saharan dust and its effects on the early rainfall season. 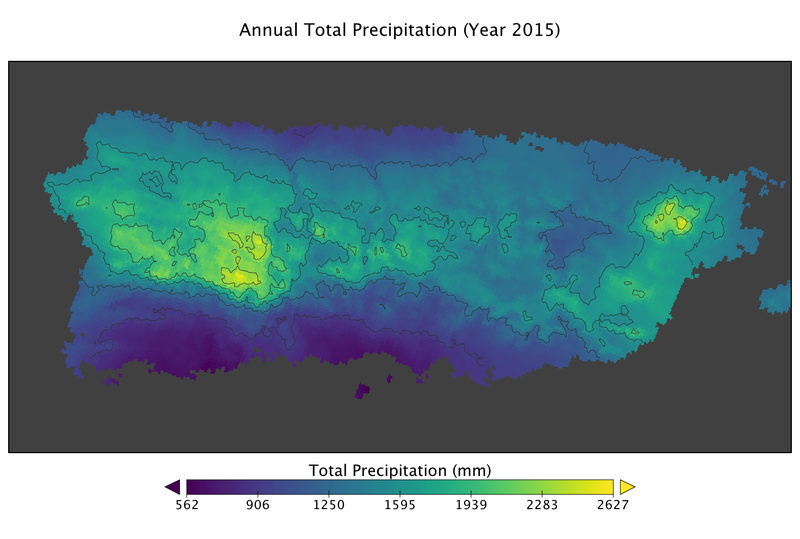 To asses the timing and magnitude of the drought in the complex topography of eastern Puerto Rico, investigators used the ORNL DAAC Daymet data. Daymet was used to establish a long-term climatology (1980–2015) for Puerto Rico's precipitation. Researchers examined the spatial distribution of daily rainfall in eastern Puerto Rico during 2015, and the most comparable drought year in the modern record, 1994. In addition to the spatial variation in drought severity, the Daymet data set helped to establish the periods of most significant rainfall departures. Despite a normal start to the year, by mid-May the 2015 average total rainfall deficit across eastern Puerto Rico surpassed 1994 in severity, and through mid-August, the 2015 and 1994 droughts remained roughly equivalent over the eastern half of the island. Further analysis of AVHRR aerosol optical thickness showed that Saharan dust arrived early in the Caribbean in 2015 and resulted in conditions that were unfavorable for rainfall. The early rainfall season (April‐July) in eastern Puerto Rico is strongly related to conditions associated with Saharan dust intrusions.